Revisiting When the Mountains Tremble (1983) for the first time in years is apt to take the viewer back to their first encounter with this remarkable documentary. I first watched the film in the 1990s, not long after Rigoberta Menchú, an indigenous K’iche’ activist from Guatemala and the film’s most prominent voice, was awarded the Nobel Peace Prize. By that time, the story in the documentary was well-known. A brutal, hidden civil war, due in most part to a U.S. foreign policy in the Central America that had turned toxic—corrupt anti-communism, military dictatorships, the harsh suppression of pro-democracy movements. As a student of film, I was awed by the combination of fearlessness and empathy shown by directors Pamela Yates and Thomas Sigel as they pursued this story. “Independent filmmakers were working in Central America because of our interest in these wars of national liberation and as a watchdog force to report on US government military activities,” Yates explained in an email interview last week with the Messenger. “My anger led me to tell the story of When the Mountains Tremble, and take a lot of risks in the process.” In 1984, When the Mountains Tremble won a jury prize at the Sundance Film Festival and was later broadcast on PBS, bringing the plight of Guatemala to a national audience. At the time, some critics recoiled from the film. Yates and Sigel cut across many levels of Guatemalan society—from indigenous village life to rebel outposts, from churches to sectarian splinter groups, from plantation life to the palaces of the military leadership—and displayed an open admiration for the culture and experience of their indigenous activist subjects. The rich detail of this portrait, anchored by personal accounts from 22-year-old Menchú, extended a template used by many activist films to follow: an iconography of handheld treks to remote places of protest and conflict, traumatizing shots of fresh atrocities, footage of daily life interrupted by waves of men with guns—some from the military, others from guerrilla fighters—and always, always crowds. The mass movements of the oppressed, in the streets, trying to make change against all odds. Later I would realize what a splash of cold water When the Mountains Tremble must have been to audiences in 1983. Less than ten years removed from Vietnam, the film reveals a mini-Vietnam not far from our southern border. Images framed, as in Southeast Asia, by mud and by men in helicopter gunships. The political hand-waving was the same, too, as we see in clips of President Ronald Reagan whipping up support against the “red menace” in Central America. Events hidden by history or conspiracy are shown through staging and re-enactments, a bold technique. Foreshadowing Errol Morris’ legalistic use of this technique later in the decade, Yates and Sigel embraced the power of cinema to create the conditions for justice; they were willing to speak back to power with all the storytelling tools at hand. Yates’ friendship with Menchú and commitment to social change have led her back to this story again and again. In the early 2000s she was asked to review her outtakes from When the Mountains Tremble to assist an investigation into crimes against humanity during in the 1983 Civil War. Her journey into the archive of her first film, and then return to Guatemala, became the basis for 2011’s Granito: How to Nail a Dictator, as Yates followed the threads of narrative through five main characters struggling to unlock and reclaim that hidden history. 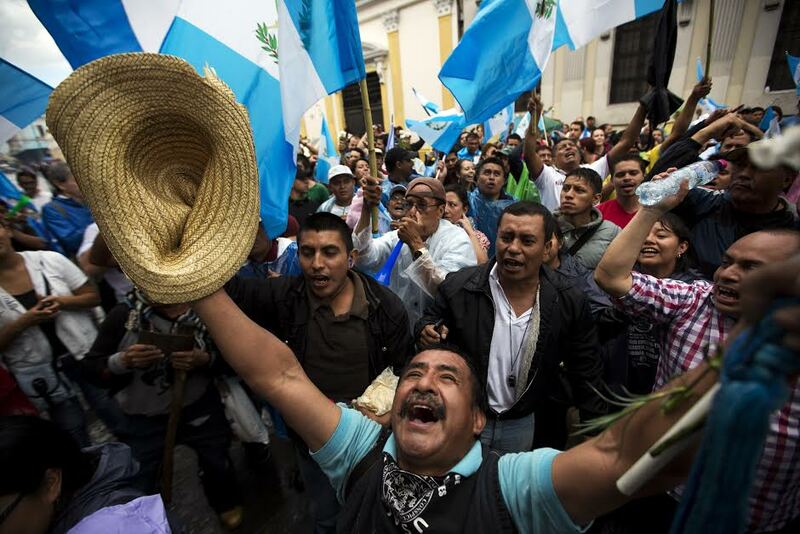 In turn, the story of the trial that followed (which would eventually send General Rios Montt to prison for genocide) became the foundation for this year’s 500 Years, which celebrates Guatemala’s indigenous defenders and their efforts to turn this pivotal moment in their nation’s history into lasting change. Seen together, the three films of The Resistance Saga present a remarkable record of one society struggling with a dark history, but also one filmmaker’s decades long commitment to exploring the boundaries of how film can help improve the lots of the disenfranchised, wherever they are. All told, the Resistance Saga shows humanity at its most beautiful and its most ugly, but it is ultimately hopeful, encouraging people to organize and confront their abusers head on.